PALO, Leyte – The Mines and Geoscience Bureau of the Department of Environment and Natural Resources in Eastern Visayas has recommended for the suspension of all the small scale mining permits in Eastern Samar by DENR Secretary Ramon J. P. Paje. MGB Region 8 Director Roger de Dios informed that he has made the recommendation through a communication which was sent in December of 2011, addressed to MGB Director, Engr. Leo L. Jasareno, copy furnished the DENR Secretary. Director de Dios said that it is only by suspending the small scale permits issued in Eastern Samar, that the proliferation of illegal small scale mining activities in the province will be stopped. The MGB Director also recommended for the creation of a composite team composed of MGB 8, EMB-8, PENRO Eastern Samar, and the Provincial Government of Eastern Samar, to reassess or validate all SSMP areas for possible lifting of the suspension subject to compliance of stringent requirements like submission of work programs and rehabilitation plans, establishment of Mine Rehabilitation Fund for each permittee and creation of Municipal Monitoring Team for close monitoring of mining operations. The recommendation was reached after a thorough monitoring and field investigation conducted by the MGB technical personnel on November 28-29, prompted by numerous complaints about the rampant illegal small-scale mining activities in the province of Eastern Samar. Field investigations were conducted in the municipalities of Salcedo, Guiuan, General MacArthur, Llorente and Hernani, all of the province of Eastern Samar. The general observation of the investigating team was that the SSMP holders were buying ore concentrates from illegal contractors. 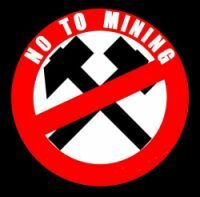 Another observation is the reluctance of several concerned local government executives to be at the forefront of the campaign against illegal mining operations because it will adversely affect their bid in the coming elections. They are all, however, amenable for the suspension of mining permits to stop illegal mining in their respective areas, the investigating team reported. It may be recalled that during the Congressional-LMP Interagency Consultations initiated by the Hon. Congressman of the Lone District of Easter Samar Ben Evardone on November 18, 2011, at Borongan City, the illegal small-scale chromite mining operations which reportedly caused great environmental damage in their respective areas, was the main concern raised by the LGU representatives. They were all amenable to putting a stop to the illegal mining activities in their localities. The Alliance for Nationalism and Democracy (ANAD) Partylist blasted Jose Ma. Sison for his continued lies and deceptive skill when he said that he has no interest in coming back to the country, much more a Cabinet position in government. ANAD Rep. Jun Alcover lambasted Sison for saying “. . . Return home and a Cabinet post for me? That is just psy-war intrigue spread by a military group associated with former Defense Secretary Norberto Gonzales, the butcher general Palparan, and Alcover of ANAD. . . . I continue to be abroad in the hope that formal talks between the government and the National Democratic Front of the Philippines negotiating panels will resume in Oslo” (01-24-12 www.manilastandardtoday.com). “His (Sison) denial has fallen flat on his face because it meant nothing, much less any change, on his terrorist organization’s intention seeking a truce and alliance with government anchored on a 2005 10-point Concise Agreement for an Immediate Just Peace that government has rejected time and again,” said Rep. Alcover. “Even in 2011, the same was demanded by his group which was flatly turned down by the government of PNoy. What alliance with government is Sison and the NDF peddling around? 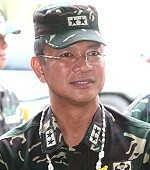 In truth and in fact his motives and direction are no different from the 12-Point NDF Agenda and the CPP 5-year plan (2011 to 2015) that seeks to establish a coalition government and strategic stalemate, respectively, in the country leading to the total capitulation of our freedoms, democracy, and government!,” Rep. Alcover said. “Now who is doing psy-war and caught lying to his teeth? Unbelievable is the fact that Sison and his cabal of vultures have never manifested sincerity in the many peace negotiations with government. Yet, they have the guts and courage to exact sincerity from government? For what?” the pro-democracy solon said even as he decried continuing efforts by both the Smiling communists and Maoist terrorists political operators for Joma’s return and a cabinet position. “Until today, nothing has changed. It is only Sison who is denying it. But nobody believes him anymore. He was caught lying to his teeth on the Plaza Miranda bombing; the thousands of Filipino lives wasted in many Maoist terrorist purgings, and the thousands of innocent Filipino lives snapped and sacrificed in the altar of the violent and inhuman Maoist communist ideology,” Rep. Alcover pointed out. “He was lying before, lying today, and shall always lie in the days to come! We must be wary of liars!” Rep. Alcover added. PALO, Leyte – The importance of civil society organizations’ participation in the process of budget preparation was emphasized during the FY 2013 Regional Budget Forum conducted on January 20, 2012 at the DPWH Multi-Purpose Hall in Palo, Leyte. DBM Region 8 Director Imelda Laceras said that transparency is an important element of a good budget process. The participation of CSOs will increase the transparency in the budget process and will help increase accountability and use of public funds. The Lady Director said that the DBM-8 conducted an inventory of CSO operating in the Region in order to ensure the participation of CSOs in the budget preparation process. The 26 CSOs listed were duly invited to the FY 2013 Regional Budget Forum but although only one CSO was represented, the DBM Director expressed appreciation that CSOs are gradually actively participating in the budget preparation process. During the Forum, Dr. Socorro S. Gasco representing the Association of Deans of Philippine College of Nursing honestly admitted that she’s a stranger to government’s budget processes and budgetary terms and languages. She made comments however, from the point of view of CSOs, on some budget execution practices that they observed of some government agencies. Director Laceras in response to the comments said DBM will coordinate with the concerned agencies mentioned. She also said that the workings of the bureaucracy is guided by laws and rules and regulations and that the Commission on Audit is tasked of seeing to it that agencies will not deviate from policies on the use of government funds. She also expressed hope that more CSOs will be engaged in the near future. To underscore the importance of CSOs, the DBM Central Office is in the process of crafting guidelines anew in regards to CSOs’ involvement not only in the budget preparation phase but also in the other phases of the budget cycle, such as in the execution and accountability, Dir. Laceras disclosed. TACLOBAN CITY – The Local Government Support Program for Local Economic Development (LGSP-LED) pushes for private sector-academe partnerships for local government units to deepen economic collaboration and to help fuel local economic development. The provincial government of Leyte hosted on Tuesday the LGSP-LED Forum on Engaging the Private Sector and Academe to share concrete Filipino, Canadian and international examples and experiences on how the LGUs can link with the private sector to grow and diversify their local economies resulting in more investments, jobs and an increased tax base. The forum’s speakers were global expert on developing creative rural economies Dan Taylor and Leyte Gov. Carlos Jericho Petilla. In his lecture, Taylor shared his experiences in growing local economies, emphasizing the role of government as enabler and facilitator of the process. Taylor espoused that as “economies and the practice of economic development change, communities must look at all of their assets both performing and underperforming, and determine which ones can be harnessed as community and economic building blocks”. Gov. Petilla, on the other hand, shared Leyte’s experience in partnering with the academe in the challenging work of human resource development to ensure that job skills match the needs of the local industries. The governor shared that the province has continuously worked with state colleges and universities in the region to diversify their offered courses to address the employee needs of existing and operational industries in and outside the region. The LGSP-LED forum was also an opportunity to introduce the upcoming Guide for LGUs on Formulating a Local Investment and Incentives Code. The code, it was learned, is a proactive measure to draw both local and foreign investments especially in priority area in a locality. Select LGU alliances, namely the designated Local economic and Investment Promotions Officers, across the Philippines participated in the forum that included the province of Leyte, Allah Valley Landscape Development Alliance comprised of the provinces of South Cotabato and Sultan Kudarat, Panglao-Dauis-Baclayon (PaDaYon) Marine Triangle of the province of Bohol and Northern Samar. LGSP-LED is an eight-year old collaborative program of the Philippines and Canada through the DILG and the Canadian International Development Agency (CIDA). Now on its fourth year, LGSP-LED is geared towards strengthening the enabling environment for good governance and sustainable local economic development. MANILA – Reacting to news reports, a group of women advocates working with grassroots communities hits a Catholic Bishop Conference of the Philippines (CBCP) official for his statement warning the public to be vigilant because of his suspicion that the highly clamored Reproductive Health (RH) bill may end up like the Corona impeachment complaint. Elizabeth Angsioco, National Chairperson of the Democratic Socialist Women of the Philippines (DSWP) argued that Father Melvin Castro, Executive Secretary of the Catholic Bishops’ Episcopal Commission on Family and Life, is again propagating misinformation and disinformation on the RH bill by insinuating that the said bill has not been subjected to due process in Congress. “Is this a case of selective amnesia?” Angsioco asks. “Fr. Castro knows well that the RH Bill has been pending in Congress for more than a decade and that it has been the subject of discussion from the Committee level up to plenary sessions in both chambers of Congress,” she explains. Angsioco asserts that the anti-RH lawmakers have failed to come-up with new arguments. What they do is use technicalities as delaying tactics to prevent the bill from being voted on. Thus, the RH bill cannot and should not be unfairly compared with Chief Justice Corona’s impeachment by the House of Representatives. Fr. Castro’s statements only revealed that the anti-RH camp does not have the numbers in Congress and that they are scared to put the bill to a vote because they know they will lose, said Angsioco. “Why else do they continuously oppose the voting? Clearly the delaying tactics are meant to prevent Congress from taking the vote on the measure,” she added. Meanwhile, Angsioco calls on Congress leadership to already close the period of interpellation and move on to the period of amendments then vote. “After more than a decade, legislators by now surely have their positions even if some choose to remain quiet on the issue,” she said. “There is no more reason not to call for a vote. The Filipino people have been patiently waiting, mothers, particularly poor mothers, continuously die because of CBCP’s opposition and Congress’ turtle-like pace in processing the much needed bill, Angsioco ended. 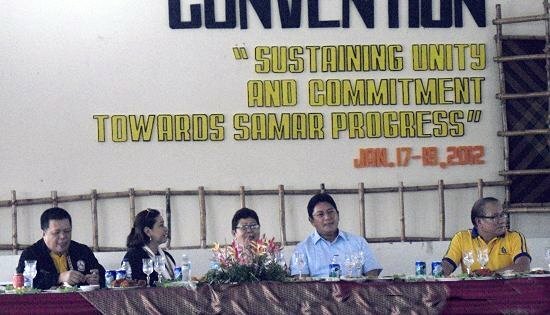 CATBALOGAN CITY – More or less 156 Samar legislators attended the 1st Provincial Convention of the Philippine Councilors League - Samar Chapter held last January 19, 2012 at the Cultural and Convention Center in Calbayog. The participants were welcomed by a Sarakiki-Hadang Ritual performed by the scholars of the Calbayog City Arts and Cultural Office (CACO). Being hosted by Calbayog City, no less than the City Mayor, Hon. Ronald P. Aquino; PCL Samar Chapter President, Hon Roger Casurao and Samar’s First District Congressman Mel Senen Sarmiento graced the occasion to welcome the delegates. As speakers, the PCL invited its National Chairman, Hon. Alan Zulueta and its National President, Hon. Alma Moreno-Salic. In its welcome message, Mayor Aquino thanked the PCL for holding its first convention in Calbayog. He expressly shared his vision to make Calbayog as the convention capital in Eastern Visayas. Zulueta delivered lengthily the “Innovations in Local Legislation” which is said to be a key to building transformational governance in Samar. Moreno-Salic gave an update on what she has accomplished under her term. On the other hand, Cong. Sarmiento shared a timely discussion on climate change and its challenges to urbanization and the government’s policy response. The session was ended with a press conference attended by the local media. The panel was composed by Hon. Roger Casurao, Hon. Alan zulueta and Hon. Mel Senen Sarmiento. One of the questions raised was on the performance evaluation of the legislators. According to Zulueta, the Department of Interior and Local Government (DILG) as partner of the Philippine Councilors League, provides an assessment tool for local government units. A tie up with other agencies in the implementation of the Local Legislative Award Program where a regional selection committee is tasked to assess the performance of the legislative councils based on specific criteria has been undertaken. A Sangguniang Bayan’s performance is being rated on the number of legislations passed, office structure, sessions and effectiveness of their personnel. Moreover, an ongoing competition for the Ten Most Outstanding Councilors of the Philippines is being partnered with Sen. Edgardo Angara. An outstanding councilor is expected to receive one million pesos worth of project funded by Angara. The award is intended to encourage legislators to enhance their capabilities and motivate them to better serve their constituents. To further improve the competency level of PCL members, Casurao announced the institutionalization of the PCL’s Legislative Academy. The academy has already produced 19 graduates of a Masters Degree and 600 more are expected to graduate from its masteral and baccalaureate degrees. Recently, the Civil Service Commission thru Republic Act No. 101-56 has conferred upon members of the Sangguniang Bayan or Sangguniang Panlalawigan the appropriate Civil Service Eligibility. The said law was approved by President Benigno Aquino on December 20, 2011. A councilor who has finished college or a bachelor’s degree and has served nine (9) years or three (3) terms will be entitled to a Career Service Professional Eligibility. If a member has only six (6) years service as legislator, he is entitled to a Career Service Sub-professional Eligibility, provided that he has earned at least seventy-two (72) units in any four year course in college or baccalaureate degree program. The members are reminded to comply with the Civil Service Commission’s requirement in the conferment of the said eligibility. The qualified applicants have to submit their service records, transcript of records and other credentials which will be processed for approval by the CSC. Another issue raised by the local media is the possibility of amending the qualifications of would be legislators in order to fully deliver its mandate as legislators. As legislators, the need to increase the educational level in order to have a comprehensive understanding of their responsibility as lawmakers and respond effectively to the needs of their constituents was a topic of discussion. This was asked by the media after commenting on the reality that there are legislators who cannot even read and write. PCL Chair Zulueta informed that moves have been initiated to deliberate on the issue. However, the Local Government Code and the 1987 Philippine Constitution provides for a very minimal requirement. Casurao explained that the provisions could not be violated to give every citizen the opportunity to run as mandated in a democratic country. A constitutional amendment needs a legislative act of congress, Casurao adds. The convention was generally considered a success by the organizers despite the absence of more than fifty (50) more legislators from Samar. Most participants were delighted to be billeted at the new Ciriaco’s Hotel that hosted a party in the same evening. CAMP LUKBAN, Catbalogan City – “The recent attack against a community of peace-loving people in Lapinig, the despicable murder of Mr. Jovito Pajanustan in Catubig and the ambush on soldiers doing community work in Las Navas by the ‘organized crime group’ locally known as the NPA were all desperate acts of terror to restore their influence in Northern Samar” said Maj Gen Mario F. Chan, Commander of the 8th Infantry Division of the Philippine Army. “We condemn in the strongest possible terms these dastardly acts of terror perpetuated by the NPAs against the peace-loving people of Lapinig, the brutal murder of an innocent farmer and the ambush on soldiers who were engaged in community work to help the people in Las Navas”, added the good General. According to the 8ID Commander, the climate of fear sowed by the NPAs among communities in Samar Island has dissipated as the people have come to realize and appreciate the sincere efforts of the government and stakeholders to bring peace and sustainable development in the Region as manifested in the declaration by the Local Government Unit of Southern Leyte of an “Insurgent-Free” province on September 29, 2011 and followed by the declaration of the Local Government Unit of Leyte of a “Manageable Conflict-Affected and Development-Ready ” province on December 8, 2011. “Because of their waning influence, this NPA or group of thugs and bandits has embarked on a systematic and orchestrated employment of deception, treachery and violence and terror beginning with their murder of Mr. Pajanustan in November 2011 in order to blame it on the soldiers who were actually involved in community work,” said MGen. Chan. He stated further that, “Knowing the futility of this deceptive act, the NPA group called on its cohorts ‘Migrante’ and ‘Sagupa’ to join in the accusation with fabricated data and information that was readily and handily exposed as lies by affidavits of local officials in Barangay Osang of Catubig and San Miguel of Las Navas and the PNP-Catubig Spot Report. “The truth would eventually surface to manifest their peddled lies so the NPA embarked on acts of violence such as the ambush of the soldier-community worker in Las Navas in December and the recent attack on civilians in the quiet town of Laping last January 20,” said the 8ID Commander. “These acts or desperation to regain lost influence are typically manifested in NPA armed engagements where their volume of fire is greatest during their retreat,” observed MGen. Chan. “Notwithstanding these acts of terrorism by the NPA, the 8ID will continue to pursue to ‘win the peace’ in the affected areas and finally rid the region of this menace to development,” MGen. Chan concluded. TACLOBAN CITY – The construction and rehabilitation of 62 bridges in Samar and Eastern Samar are part of the Secondary National Roads Development Project (SNRDP) under the Philippine Compact with Millennium Challenge Corporation (MCC). Engr. Rene Galapon of the Department of Public Works and Highways Regional Office 8, who is the Project Engineer, informed that of the 62 bridges, 17 are for total replacement, 42 are for rehabilitation and repair and three are for completion as they are now ongoing. Under package A of the project, 28 bridges are involved. These include 12 bridges that are up for minor rehabilitation, three (3) bridges which are due for super structural replacement, six (6) will undergo sub-structural repair, pier retrofit and pier replacement and seven (7) bridges are due for total replacement. Package B includes 34 bridges, 16 of which will undergo minor rehabilitation, four (4) are due for pier retrofit, and 14 are due for total replacement. The SNRDP involves not only the construction and rehabilitation of a 220-kilometer of existing roads and bridges covering two provinces in Samar Island but also involves road widening, drainage installation and other road safety improvements, Engr. Galapon said. The SNRDP begins at the junction of Pan Philippine Highway and Buray (Wright) in Western Samar and passing along mountainous terrain to Taft, Engr. Galapon further said. From Taft, it continues southward along the coastline of Eastern Samar ending in Guiuan, passing through a total of 15 municipalities. The roads project is expected to accrue economic benefits by lowering vehicle operating costs, and saving the time of people living near the roads thus enabling them to have greater access to commercial activities as well as to their basic needs, Engr. Galapon added. The project recognizes DPWH standard right-of-way limit, the DPWH engineer said. This was the message brought by human rights advocates and families of victims of human rights violations at the Department of Justice today on the first year of the killing of Palawan broadcaster Gerry Ortega. Meanwhile, Ortega’s wife, Patty, and their four children are in Palawan for a Mass held in Ortega’s grave. There will also be a candlelighting activity in the afternoon. “Ang bagal ng hustisya sa Pilipinas. Isang taon na, nag-uumapaw ang ebidensya, hindi pa rin masampahan ng kaso ang itinuturong mastermind sa pagpatay kay Daddy (Justice is too slow. Amid overwhelming evidence, a year after, a case has yet to be filed against the mastermind in Daddy’s killing),” said Micaella Ortega, eldest daughter of Ortega. Criticizing the continued delay of the release of a DOJ resolution, Hustisya, organization of victims of human rights violations, said they are disappointed that a strong case such as that of Ortega remains unsolved after 12 months. “Not all cases have the same strong evidence against the mastermind and Ortega’s killers. We have hoped that the evidence presented in Ortega’s killing may speed up the resolution of the case. However, the snail-paced progress of the prosecution further perpetuates impunity because the perpetrators remain on the loose,” Hustisya secretary general Cristina Guevarra said. At the DOJ preliminary investigation, the gunman and the other suspects involved have implicated former Palawan Gov. Joel Reyes in Ortega’s killing. In the first preliminary investigation, however, Reyes was not included in the respondents of the case. The family then appealed for a reinvestigation of the case, seeking to include Reyes. “We need to prosecute criminals such as those implicated in the case of Dr. Ortega. They do not only kill environmental defenders. With their greed to further profit themselves at the expense of the environment, they destroy and kill more people.” she said. Apart from being involved in corruption issues in the province such as the misuse of Malampaya funds, and his connection with former president Gloria Macapagal-Arroyo, Reyes is also known to promote mining in the province, which Ortega and the people of Palawan have strongly opposed. “If the Aquino government can hasten the impeachment of a crony of former president Gloria Macapagal-Arroyo in the Supreme Court, it should by all means do the same in prosecuting all her other minions,” Guevarra concluded.